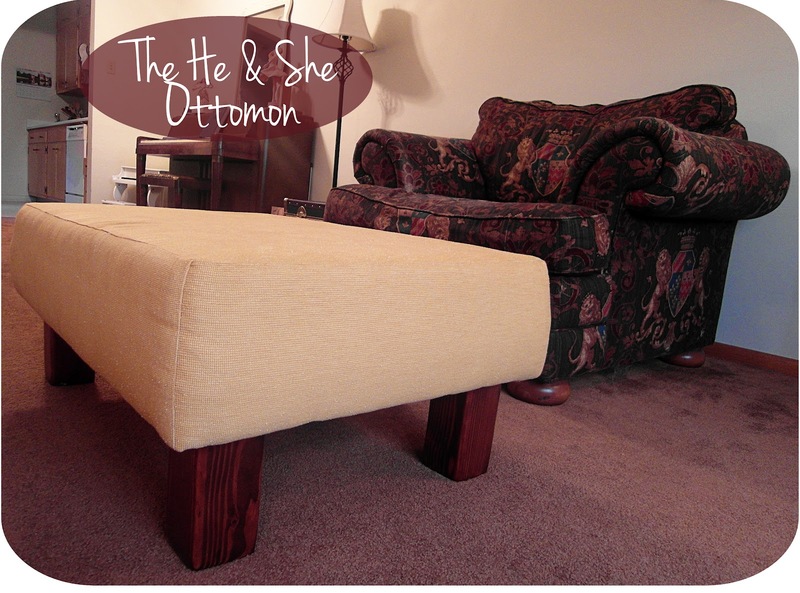 ' An Ottoman made by He and She - Sisters, What! When I say "he" and "she" I mean my husband and I. There are not many projects that the hubs is willing to do with me, but occasionally he'll join in, especially if wood or power tools are involved. In the most recent case, the project was making an ottoman from scratch. We've been wanting one for a long time, but they can be pricey and we're not rich. After a while, I started getting the idea in my head that we could make it ourselves (pinterest has a way of making one feel mighty). After all, the hubberoo made our bed frame so I figured this would be right up his alley. 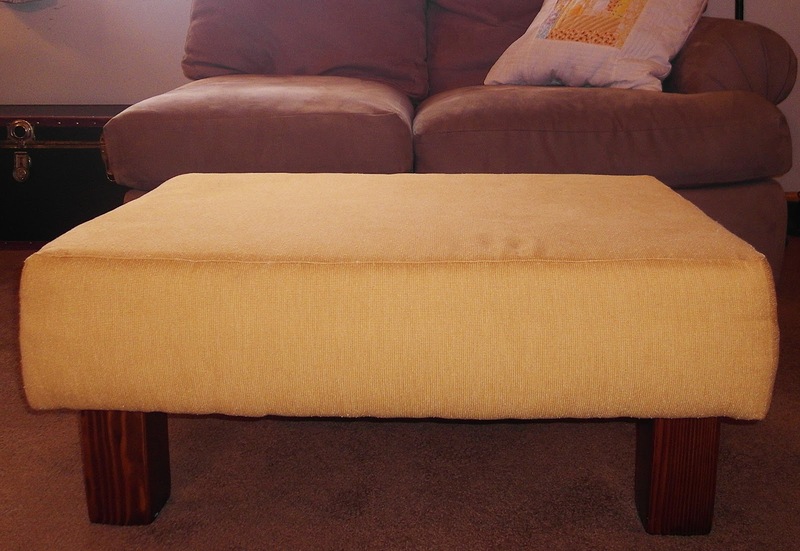 And so our journey together to make this ottoman began in March (yes, it took us a long time and my mighty self became humbled) We finally finished it last week, but not without much crying and gnashing of teeth. It was all from me while sewing and seam ripping and then sewing; I had no idea what I had got myself into. I had this brilliant idea to do piping but started getting cold feet about it (for good reasons too). However, the lady at the upholstery store told me that piping would be a cinch, hmm ya not for me. There were many heavy tears as I seam ripped out the failed piping. The hub was very nice to me about the whole matter even though he must have seen how bad it looked. I learned my lesson and decided to save piping for a later and easier project. Without the piping, I was shocked that all the corners and edges matched up. A miracle for sure. Well there you have it. 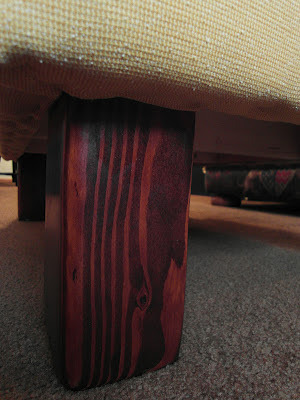 All though Brigg strictly did the wood part and I the fabric cushion, there is no way we could have done each part without the other; seriously, talk about a relationship builder. I have learned for the millionth time how different we think, seriously. I really can't wait for the next project we do together, maybe a chair to match the ottoman...just joking : ). After we finished it, we didn't know what we ever did without it. But during the day hours, we don't get much use out of it because the wee one has commandeered for his own purposes and we don't mind a bit. *I wanted to show you a little tutorial on the making, but because it took so long to finish it, I am now having trouble find the work in progress pictures. I'll see what I can scrounge up. great diy! 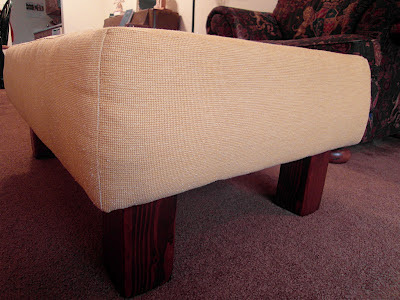 this looks well constructed, and super cushy! Sounds like a fun project to do together. Oh how I hate sewing projects that make me cry! This turned out so cute! That is so nice that your husband helped out on it! I just found your blog and it is so great! I am your newest follower! If you ever have time come checkout mine! Wow, the hard work and tears were worth it, it looks wonderful! I found your blog on the Friday Fun Party and I'm a new fan and follower. I love how this turned out! Now I wanna convince my hubby into making one! Would love for you to share at the Pomp Party! So glad you linked up! Pinning! Very smart looking! Great work! I love doing projects with my husband - when we have time to work together!